Choose 39" or 20" length. Battery pack is approximately 1.7" long x 0.75" wide x 0.2" thick. Run time is 60+ hours on one set of batteries. For use in centerpieces, on the mantle, lanterns, in wreaths, for costumes, etc. Rustic Fairy Lights wrapped in twine. Runs on 3-AA batteries (not included). 15 feet long. 50 warm white LEDs. 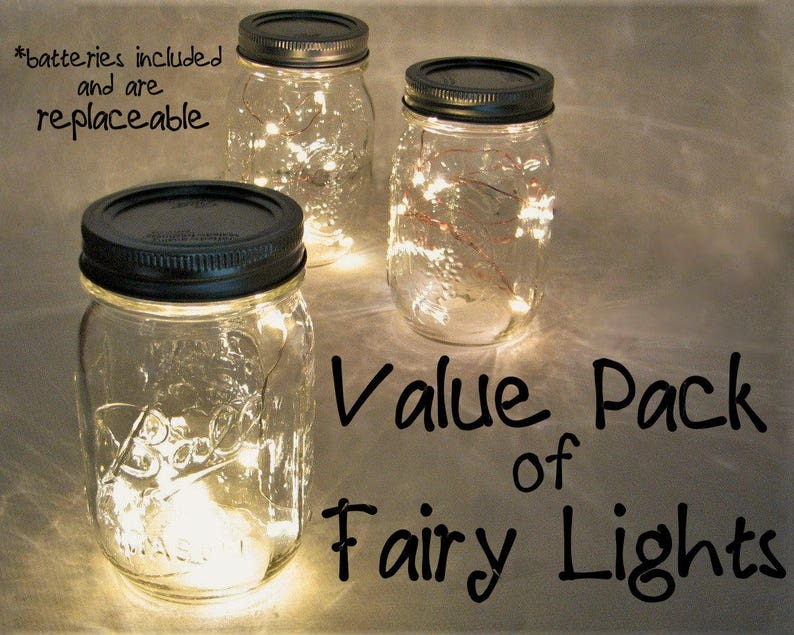 Copper Fairy Lights with LED lights - uses AA batteries - on timer. 18 LEDs each, uses AA batteries, 3' long. 6' Copper Fairy Lights with LED lights - uses AA batteries - on timer. 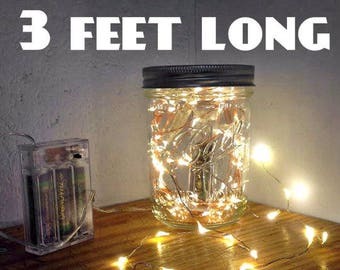 36 LEDs each, uses AA batteries. Remote control option. VALUE PACK Colored or White LED Coin Cell Fairy Lights - strings of 10 Fairy Lights 39" long wire. Batteries included and replaceable. 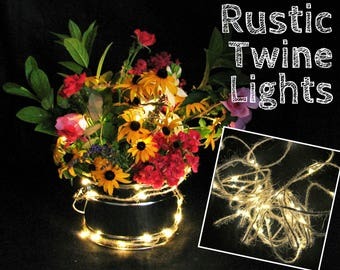 50 Warm White (Silver or Copper Wire) LED Fairy Wire Lights. Indoor or outdoor use. ~8.5 feet long. Uses AA Batteries or plug in. Pack of 5 Wine Bottle Light Strands with 10 LEDs per strand. Battery powered, on/off switch, batteries can be replaced. Warm White LEDs. I received product. I have not display with it yet. but will keep you posted as soon as I use it in my craft. The shipping took almost a month to reach my destination and in future I will have to order in bulk to get a cheaper shipment fee. We accept credit cards, Paypal, and Etsy gift cards for payment. Yes. To return or exchange any product, you must call in and obtain a return authorization number. Product must be unopened and returned in condition suitable for resell. Product that has been used for display purposes is not considered a defective item. Product that has been sold and gets broken after the sale is not considered defective. We will not accept returns or exchanges 1 month after receipt of your order. Extreme Glow does not sell merchandise on approval. Initial shipping costs will be deducted from your return amount. Customer is responsible for the condition of the items while in transit. We highly recommend that insurance be purchased with any return shipment. Please note: Extreme Glow does not accept returns on custom orders. Shipping costs will be deducted from your return amount. Please note: Extreme Glow does not accept exchanges on custom orders. How do you handle shortages and defective items? Shortages: Any order which is shipped incomplete will be completed by Extreme Glow. We will either ship the missing items at no additional shipping charge or provide credit to your card for the missing items. Notification of shortages must be made within 3 days of receipt of merchandise. Please note: We cannot expedite shortage requests and we reserve the right to issue credit in the event that we cannot deliver incomplete shipment items in a satisfactory time frame. Defects: If any merchandise is defective, Extreme Glow will resolve the problem. We strongly encourage you purchase enough goods to allow for some defective or damaged product (we recommend +5%). Defective merchandise that totals less than $10.00 will be refunded to your credit card or Paypal account. We will not reship claims under $10.00. Defects will not be honored after 30 days from receipt of merchandise. We reserve the right to request that all defective merchandise be sent back to Extreme Glow. Replacement merchandise will be sent or credit issued once the defective items arrive. Returns received without first getting a Return Authorization number will be refused. Merchandise that has been used (for display, sold then returned, etc) or broken is not considered defective and credit will not be given for these items when returned. Please allow 1-2 business days after your return is received for Extreme Glow to evaluate and issue credit. Should you require replacement products on exchanged or defective items prior to your claim being processed, you must place a separate order and be responsible for the charges on that order until we receive the items back. At that time you will be credited for the second order. PLEASE NOTE - It is your responsibility to purchase enough goods to allow for some defective or damaged product. We do not reship damaged or defective goods automatically. Because of the nature of different claims and problems with defective merchandise we reserve the right to issue credit rather than reship the product. How do you handle damaged packages or broken merchandise? If you receive a visibly damaged packaged, please contact us ASAP so that we can files a claim with the carrier. Failure to file a claim in a timely fashion could result in a disallowed claim. We ship orders every weekday except holidays. The majority of our orders will ship by First Class or Priority Mail. We also use UPS Ground, FedEx Home Delivery, and FedEx Air for 2-Day and overnight shipments. If you need expedited shipping, send us a message, and we will give you the shipping rates for upgraded service. We ship internationally as well - if you don't see your country listed, please contact us and we will assist you with your order. 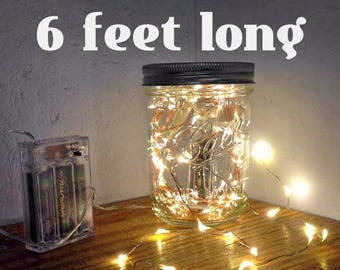 100 Warm White (Silver or Copper Wire) LED Fairy Wire Lights- 5 meters (~16.5 feet) long. Timed Lights, battery pack or plug in lights. Remote Controlled Fairy Lights - 8 Different Modes - Timer Setting - Dimmable. Runs on AA batteries. Can be used outdoors (weatherproof). 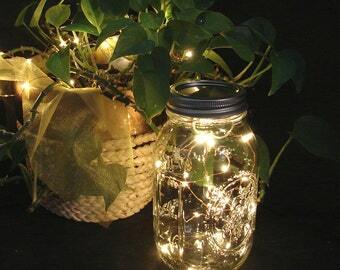 TWINKLING Fairy Lights for Christmas Wreaths. Silver or Copper Wire. 3, 6, or 16.5 feet long. Longer strands feature a timer. Plug In USB Remote Controlled Fairy Wire - 16.5 feet Long - Silver or Copper color. 8 Different Modes. Timer option and dimmable LEDs.